I was in Melbourne couple of days ago, wife was on her shopping spree, could not be a better time to go to watch shops and have a look at few watches in flesh which is not an opportunity for me being in small town. Oris 65 , Omega PO attracted me quite a bit. Entered next shop ( watches of Switzerland) nothing different and while I was about to leave he pulled Tudor black bay S&G . 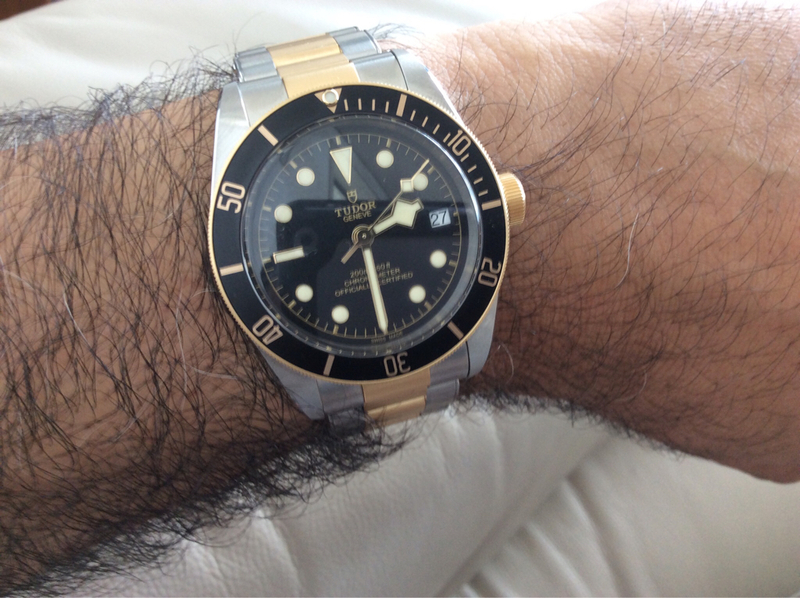 Never thought I will buy a gold accent watch and was not a big fan of tudor hands in photos. Put it on wrist and to my surprise liked it. Bit of price negotiation and the price came well below tax free from NZ and below from any online offering I could see. An hour later , walked out with the watch. Here is a quick wrist shot. Nice one. As I would say as I have the same. Did you try it on the leather also? I understand leather looks great and makes watch less shiny but leather was not available and when I kind of showed my keen interest in leather he dropped the price further making it even a better buy. I bought an after market deployment and then a custom strap from gasgasbones. Will try and post a photo later. I went for a mid brown rather than the black tudor surplies. Thanks , looks great, I will go the same route. Good luck. The most fun is always in the chase. Congrats! I love that watch, one of my favourites in the BB range. Im always lusting after Hammers one, now I can do the same to yours. Great watch! Were you able to get a tax rebate! Did you see any Tudor GMT’s over there? Actually he charged me tax free, sized the watch put in a sealed pouch with paper work which I presented to tax refund counter on airport after passport check , once counter girl took the papers out I was able to put the watch on my wrist. I opted for this instead of claiming refund. Very straightforward . Yes I had a look at GMT , loved that but wife picked this one( she is not a big fan of bicolour bezel) May be some time on a solo trip. That sounds pretty straight forward. Do you remember what the price was on the Tudor GMT? Thanks. I have seen so many watches on that day hence can’t be sure , as I remember shelf price was AUD 6500.